Stephen trained as a pianist for 5 years at the Royal Academy of Music, where he held a Vaughan Williams scholarship. He has performed at most of the London concert halls in addition to appearances in France, Sweden, Ireland, Holland and Germany. He has been a member of the Amati Piano Trio and works regularly as an accompanist for singers and instrumentalists. 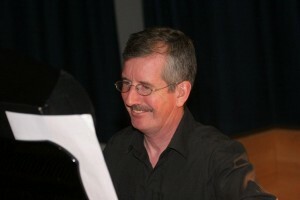 He has worked extensively as a Musical Director and conductor in London and regional theatre. He spent two years at the English Theater of Frankfurt, and was Musical Director and conductor for London City Opera (Lucia di Lammermoor, Bloomsbury Theatre, The Marriage of Figaro, Westminster Theatre, Die Fledermaus on tour). He was also Chorus Master for Jessye Norman’s concerts of Duke Ellington’s Sacred Songs at the Barbican Theatre London and the ancient theatre at Epidavros, Greece. Stephen was Musical Director for Christmas Glory, the Christmas Eve 2001 production for ITV from New York, featuring Jessye Norman, Sir James Galway and Charlotte Church. Previously he was Music Associate for Christmas Glory 2000 from Llandaff Cathedral and Cardiff Castle featuring Montserrat Caballe and Roberto Alagna and Christmas Glory 1999 from Westminster Abbey featuring Bryn Terfil and Charlotte Church. Other TV work has included the BBC production of the People’s Passion featuring Jessye Norman, Sir Thomas Allen, Robert Hardy and Kevin Whately. Last Summer he was Musical Director and Conductor for the Mardi Gras Orchestra which launched the Mardi Gras Arts Festival and performed at the Classic FM Classical Stage at Mardi Gras.